During my visit to the Speed Art Museum in Louisville, Ky., last week I got to examine a few interesting chairs (surprise!). This little black number from Franklin County (likely Frankfort), was one of my favorites. The feet taper like the neck of an upside-down Coke bottle. This leg shape is something I see on a lot of Kentucky post-and-rung chairs from the mountains. (Note: I’m sure this shape is also found elsewhere – I just come across it a bunch here.) Chester Cornett’s simpler chairs have a similar, but much more dramatic, curved taper. I like the tilted armrests. So often the armrests are horizontal to the seat, which can be a bit dull. I have no idea how these feel to the body in service (too many watchful guards…). And I adore the little black patch on the end of the worn armrests. Why is this paint not worn away? I wondered if there was some sort of dark wood plug inset into the end of the armrest. All I saw was paint. The wear pattern is unexpected – I’d expect the front to be quite worn. Anyway, this wasn’t my favorite chair at the Speed. Perhaps another time. Wear like this is typical for a chair used by someone with maybe limited mobility. I’ve seen this wear on similar chairs that were modified to hold a thunder bucket. The arms rubbed as the owner was waiting for the thunder and then again when they used the arms as leverage to stand up. I love this chair! Chris, a picture of the chair to the left? Those turned arms might have a slightly undercut or concave end. If they do, that could prevent wear. This is much more evident on the left arm. I could imagine the turner undercutting the end slightly, as he cut the finished arm free from the lathe, creating the slight concave end. I’ve done that by accident. I don’t suppose you got to touch the end of the arm? The end is convex. I didn’t touch it, but I saw it clearly in profile. Ahh chairs. I was wondering why there were no chairs in your last post about the museum (not that the other furniture wasn‘t beautiful!). Interesting wear on the arm indeed, from your zoomed in picture I think I can see the grain running continuously into the painted circular part. Were there more chairs at the museum than these four? I would be exited to see more. You bet there were more chairs. I’ll do a follow-up post on them, which will discuss proportioning. I always found that paint is much more tenacious on end grain. Perhaps that has something to do with the ends of the arms. Interesting detail on the thin rungs on the back and arms. Slender vase profiles separated by a small bead. Turned rather than shaped with a spoke shave. I know it would be tough, but any guesses on the wood used for the spindles? Someone above hypothesized they are turned instead of shaved. One thing I have noticed each time I go through John Kassay’s The Book of American Windsor Furniture is that the proportion of chairs in the rod back section that have maple spindles is way higher than the rest of the book. There are very few non-rod back chairs in the book that have maple spindles. I wonder why that is? Maybe it’s some sort of selection bias? 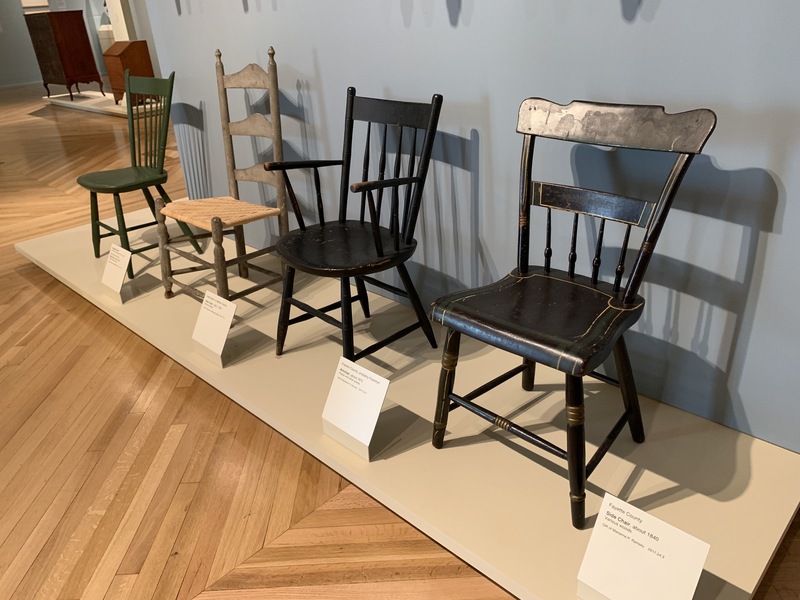 Maybe Kassay’s identification of species is more guess than anything — not a knock on his work… after all, most of the chairs are covered in at least a couple layers of paint and are over a hundred years old? But I do wonder if there’s something about the style that led craftspeople working on them to choose maple for spindles. Would turning a nicely riven piece of hard maple be manageable, compared to red or white oak? A possible counter-point to the thought that the spindles might be turned is that the spindles have an inconsistency you see out of a set of split and shaved spindles (especially looking at that fourth long spindle’s markedly different taper in the top half). Admittedly, that’s kinda just devil’s advocate… because the beads on the spindles look really crisp. Last thought… I may be conflating several things, don’t have the books in front of me now. But I think in the same Kassay book he shows a few examples of chairs where the final section of the leg turning has that bulbous, upside-down Coke bottle shape, and refers to that as a Rhode Island style. Rhode Island… Kentucky… beats me. But it’s fun as hell to talk about this stuff. 🙂 More modern stuff, I have noticed that Dave and George Sawyer, along with Drew Langsner (with the obvious connection to Dave Sawyer), use that style of double bobbin leg turning a lot. In conclusion, Windsor and stick chairs are freaking great, I like this chair, I like most chairs. Chairs chairs chairs. Looks like the maker decorated the ends of the arms with bottle caps to me. It makes sense to me that the paint stayed on the front of the armrests, since the ends are so flat and perpendicular to the length, and the radius on the round over is sharp. If you think about the way your hand would curve around that shape with your arm resting casually on it… It’s more likely your hand or arm would project forward a little without touching the flat end, than that you’d somehow create a sharp 90* angle with your wrist or fingers on the regular.